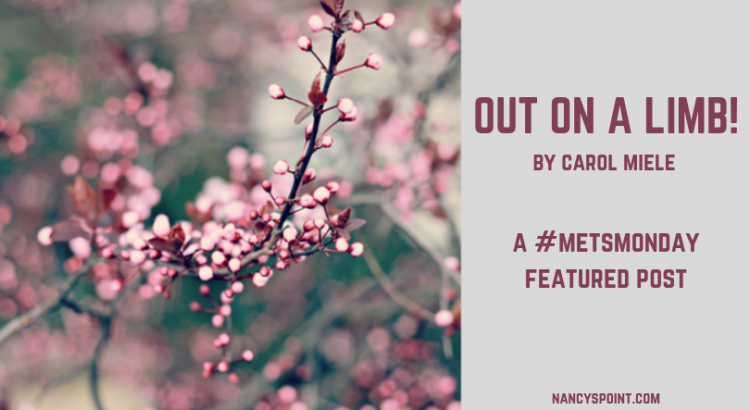 I’m pleased to share this new #MetsMonday featured post by online friend and fellow author Carol Miele. 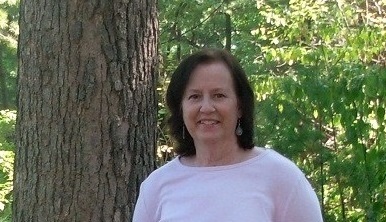 Carol shares how it feels to her living with metastatic breast cancer and what helps her cope. Regardless of cancer type or stage, I think you’ll relate to her feeling like she’s “out on a limb” analogy. Be sure to leave her a comment or ask her a question in the comments. Thank you, Carol, for sharing your voice on Nancy’s Point. As you likely know, life can throw you a curve when you least expect it or want it. You struggle to find ways of coping with the inevitable, woeful events. Some tend to cope better than others. I know what it’s like. I’ve been out on a limb for the past eight years. I can tell you firsthand, it gets lonely out there….and scary. There may be helping hands around you, but they can’t quite reach you. The depth of your distress is beyond their perception. It’s a simple dynamic. Your life hangs in the balance, theirs doesn’t. They can’t be faulted. No one can know what it’s like to be in your shoes, or more literally, in your skin. To be precise, they will never feel what it feels like in your cancer damaged, chronically painful, surgically scarred and incurably diseased body…nor in your deeply tormented psyche. Living with metastatic breast cancer is like being suspended over a canyon with a raging river below you. Eventually, the ropes will snap and you’ll fall in and die. But you don’t know when that will happen. So, you struggle on with whatever strength and resolve you have left. But the crude ropes restrict your freedom to do what you used to do, and long-range planning is gone…forever. You dangle there, shaking inside, while trying to overlook all the discomfort it causes you. You hurt all over and you’re tired, more tired than you have ever felt in your entire life. But you’re not giving up…not yet anyway! Impossibly, you hang onto your faith and the slim prospect that someone will come along with a way to rescue you. Still optimistic that a rescue may be in the offering, I remain open to new discoveries, research leading to new drugs in the pipeline, and successful clinical trials. I look around…everywhere…that is, everywhere but down. The last thing I want to do is to look down. I don’t want to jinx my “longer than expected” survival of eight plus years. Looking down could lead to going six feet down. I’m not being overly grim or morbid. If you meander down the path of abject failure, you may find it a slippery slope. Personally, I feel rather strongly that an important aspect of day-to-day survival is the state of your mind and your spirit. This is what helps me cope anyway. As for my predicament, I have always been afraid of heights. So, being out on a limb with no net beneath me is the ultimate anxiety-producing place for me to exist, even if it’s just in my head. Outwardly, I generally appear strong and steady, leading the charge in fact. Looking that way has helped me to feel that way. It’s a little like women who feel better when they put on makeup. I feel better when I adjust my mind in a positive direction. While a positive attitude, strong faith and an impenetrable spirit won’t cure cancer or guarantee your longevity, it can help your remaining time to be more tolerable, if not actually enjoyable. I still love to laugh and enjoy life, despite pain or physical restrictions. I’ve definitely opted for empowering myself to hang on in spite of my precarious position. I’ll dangle for as long as possible. When I look up, I see a spirit smiling down on me saying, I believe in you. When I look around, I see a loving family and friends who want me to prevail. I’m out on a limb yes, but I feel fortunate to have latched onto that branch. I believe it’s what helps keep me alive. About Carol: Carol Miele, diagnosed with MBC in 2010, lives in Central Florida with her husband Gene and their rescue dog Flora. She is retired from a long nursing career and now enjoys writing, painting and traveling. She is the author of two books: Metastatic Madness: How I coped with a Stage 4 Cancer Diagnosis (2012) and Kicking Cancer to the Curb! : A Glimpse Of My Life As Seen In The Rearview Mirror And Through The Front Windshield! (2015). Be a #MetsMonday featured post contributor. What would you like to say to or ask Carol? Do you have metastatic breast cancer and if yes, what helps you cope? Regardless of stage, or no cancer diagnosis at all, do you ever feel like you’re out on a limb? Hi Carol – Thank you for providing the “out on a limb” visual that I used last year when speaking with researchers who were starting a new clinical trial. Your description really got through to them. It’s a great way of explaining the feeling of not knowing. You’re such a great writer. Thanks again! You’re so welcome Sandy…I’m honored to hear that from you as you are a bit of a folk hero in Cancerland with your decades old (20 yrs is it?) MBC track record. Hi,Carol. Your “put on a limb” describes living with mbc so well. It sounded so familiar. I very much enjoyed reading this. I was first dx stage 1 in 2009. And then 2015 with mbc.- 4 places. I hope to see more of your writings in the future. Thanks!! Thank you Chris. Delighted you enjoyed reading it. It is a bit of a cautionary tale, but with the glimmer of better things to come….we just don’t know when. In our lifetime? Maybe not, but there is hope. Writing is therapeutic for me. My 1st 2 books were written to help support others with a Stage 4 diagnosis. I didn’t realize until after my 1st draft that it was indeed helpful to look back, to reflect & then to look forward. I hope to keep writing for as long as I am able & the spirit moves me! Thank you so much Carol. Your explaination of the daily grind of living with mets is spot on. I was first diagnosed with breast cancer, stage3, in 1993. I partcipated in a clincal trial and resumed my life putting cancer way behind me. On October 8 2008 I was diagnosed with stageIV for my 50th birthday. I had tumors in my lung and multiple mets in my spine. I have now been on some form of treatment for 10+ years. Out on a limb perfectly explains how I feel. And the lonliness I feel when surrounded by family & friends because they dont get it. It warms my heart that you could relate to this vision I have of MBC & my firsthand experience with it physically, mentally, emotionally, socially…..good to know we are not alone in feeling this way. It validates for me that I’m not dramatizing the most important and sobering change in my health or soliciting unearned sympathy. It is what it is. So, we soldier on! Wishing you continued success in your decades old treatment…it seems to be working! This is it! Totally and completely. One thing I don’t get though. We are the ones out on a limb, right? Why is it then when I posted this for my family and friends hoping to give them some insight on where I am, they are silent? All i wanted was a click on the like button. Why can’t they understand that some days I’m going to be tired and complain about it? Some days though I won’t complain and still be tired, but I go on and have a great time that day. They just don’t get it. I surmise that perhaps it’s not as easy for them knowing they have nothing that puts them out on the limb – perhaps it’s a feeling of guilt or reluctance in facing the finality of my life. I know they love and care for me deeply. I guess I wish they’d have more understanding. Perhaps they already give a lot. Perhaps you’ve answered your own question Iva. Not knowing your family, I can’t really say. It could be they are shocked to finally know how scary it is to have an incrable illness & don’t how to express it. Some people freeze when it registers as its hard digest, while othdrs are unsure of what to say that won’t make it worse for you. Knowing they love is heartening. Hold onto that! I have bone Mets. Breast cancer nearly 30 years ago and recurrent over a year ago. Living with a time bomb! Wow!! I know that feeling so well…I mentioned in one of my books that MBC is like having a time bomb ticking away & not knowing when it might go off. But 30 years from early stage to mets must have been a great shock to you. Yours is the longest time span I’ve hear of…Wow again! This is what needs to be deeply researched!! What triggers mets after such a long period of dormancy….who & why does it occur? Thank you for the positive feedback…we writers like to know if our words hit the mark! I’d love to attend the Metsquerade, but I will be ‘performing’ that night. I’m involved in an Off Off Broadway Theater griup & are doing 4 performances of a play (a comedy). One of the dates falls on 2/2/19. 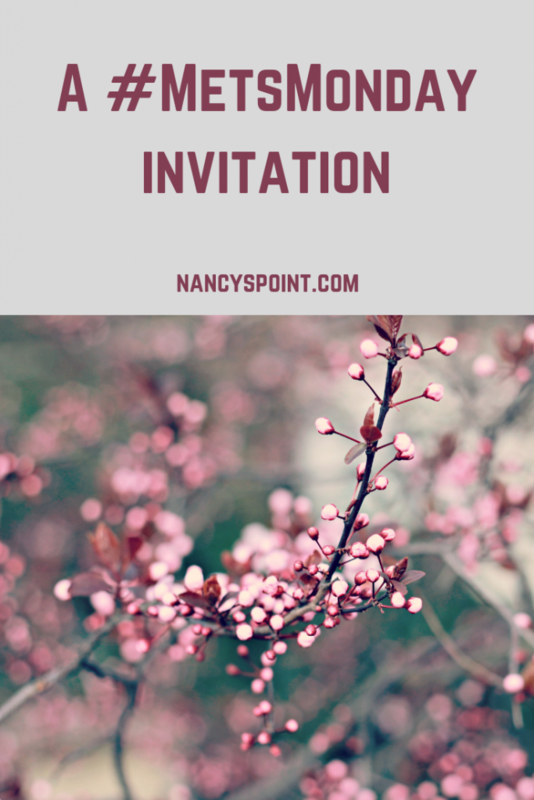 I will email you, however, to participate in your living obit…that sounds powerful & sobering! I am on year 3 of living with this and your explanation of living with this hit it right on. I try to share with others, to explain about this disease but people still think it’s curable, that treatment will not be forever. Articles like yours explain it in a way that I feel others can understand. Thank you so very much and I wish you many more years of LIVING! Wishing you every success with treatment. I cannot begin to know what you or my sister feel living with this diagnosis. Thank you for the beautiful article which I feel every family member and friend should read. God bless you!!!! Bless you Mary Kay for your compassion & insight. You sound like a great sister to someone living with MBC. I do hope family members will get involved in reading this piece to further understand how those of us with Stage 4 are affected and how we feel. Thank you, excellent read . Thank for putting it to words. It’s accurate and profound. I will definitely share . You’re welcome! Please do share….I’m hoping to support those with MBC by renewing or enhancing their faith & to help those without MBC understand us better so they can be an even more valuable support. Thanks for sharing your profoundly inspiring and moving story. It provides a strong visual for others to grasp what it is like to face MBC and how it affects every part of your life as you say, mentally, emotionally, socially and physically. I had a HER2 cancer diagnosis 10 years ago and was given a dire prognosis that never came to be even though I quit chemo early. I try to give my body what it needs to heal, especially with cancer-fighting foods and nutrition. I recent book I purchased titled Chris Beat Cancer has a goldmine of information on nutrition to help the body heal from cancer. You are a great writer and I wish you many years of living, writing and completing all you wish to accomplish. Take care and God bless you. Thank you Rosalee….I so appreciate your feedback. Its wonderful that you are proactively doing what you can to keep your body in a state of balance & healing. Wishing you continued success in your daily regime that has kept you so stable! I too hope I’ll have many more years of writing and doing other things I love to do. Hugs! You are an AWESOME, shining example of what we all should be, no matter what life throws at us. I am so very proud of you and what you have accomplished, in the middle of your suffering and pain, and so thankful that I have met you. You GO, girl!